Some of you JumpStarters may have seen the amazing video by my spanish friend Cuchy in which she shows how to create a great textured paper plate made out of toilet paper. One of Cuchy’s main tools for this techniques is a Big Shot. Now what do you do if you have no Bigshot? You…think out of the box like our JumpStarter Anje – The Crafty Cone – …check it out…it is awesome and too funny! Thank you Anje so much for sharing!!!! If you haven’t seen the original video by Cuchy, check it out on her blog. I so love it! It is so fun to see what all the JumpStarters are getting inspired to do with the videos and posts from the Creative JumpStart ! 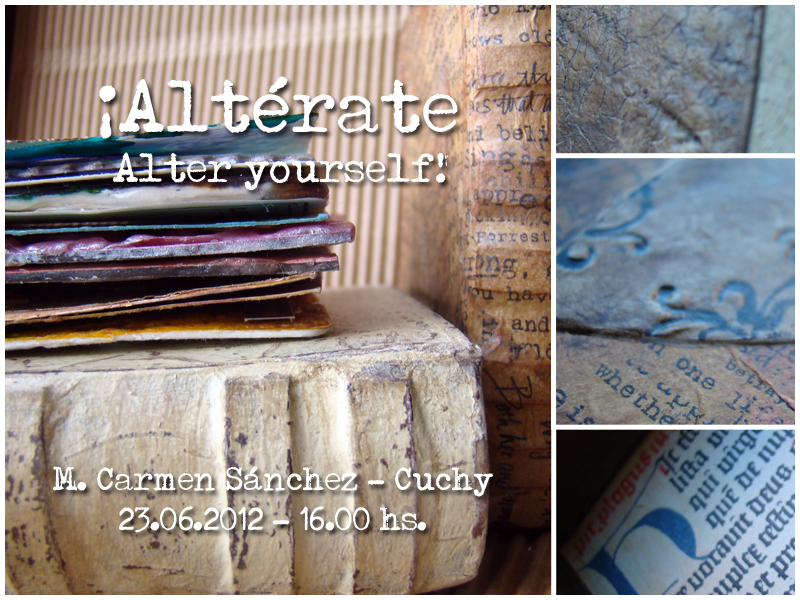 On June 23rd, 2012 Cuchy aka Carmen and I are having our second Art Mesa Workshop Event in Madrid. I will teach my Embrace the Possibilities Workshop. Embrace the possibilities. Mixed media workshop – Altered art. Nathalie Kalbach – Saturday june 23rd, 2012 – 10.00 hs. There are many ways to have your artwork on display. In this 4 hour class with Nathalie Kalbach you will create a pillow case as one of the centerpieces of your home decoration. Transfer beautiful Scrapbooking Paper and use Tattered Angels Paint Media, Acrylic Paints, lot’s of other media and Stamping Techniques to achieve unique texture and a one of a kind Mixed Media Project. All techniques can be easily applied to future Scrapbooking and Mixed Media Projects. Embrace the Possibilities and let’s have a creative pillow fight. Embrace the possibilities. Taller mixed media – Altered art. Nathalie Kalbach – Sábado 23 de junio de 2012 – 10.00 hs. Hay muchas maneras diferentes de exponer nuestros trabajos. En esta clase de unas 4 horas con Nathalie Kalbach, crearemos una funda de cojín que será el centro de atención en la decoración de nuestra casa. Transferiremos un precioso papel de scrapbooking y usaremos productos de Tattered Angels, pintura acrílica y otros mediums, además de técnicas de stampación para conseguir mucha textura y un proyecto mixed media único. Todas las técnicas se pueden aplicar fácilmente en trabajos de scrapbooking y mixed media. Aprovecha todas las posibilidades y apúntate a esta creativa pelea de almohadas. M. Carmen Sánchez – Cuchy – Saturday June, 23rd 2012 – 16.00 hs. We’ll create an altered object which holds a variety of ATC’s with lots of techniques, that we’ll make also in the class. Among the “dirty” materials we’re going to use, we have candles, patterned tissue paper, film plastic, embossing powders, acrylics, folders and dies for BigShot, bubble wrap… we’re going to iron our supplies (yes, with the iron you use at home), and as always, we will get dirty. ¡Altérate!. Taller mixed media – Altered art. M. Carmen Sánchez – Cuchy – Sábado 23 de junio de 2012 – 16.00 hs. Haremos un objeto alterado para guardar una colección de ATCs de técnicas que también haremos en el taller. Entre los materiales que vamos a utilizar, contaremos con cera de vela, papel tissue decorado, plástico transparente, polvos de embossing, acrílicos, troqueles y plantillas de relieve de la bigshot, plástico de burbujas, vamos a planchar (si, si, con la plancha de casa) y alguna que otra cosilla y como siempre, nos ensuciaremos mucho. HAHA! This is so funny, hilarious but also genious at the same time. I´m sure my neighbours would call the doctor, if I started doing this in front of our house :DD! I think I’ll keep this video to myself, my husband already thinks my crafting has taken over the house, heaven forbid I start using his garage ! This was so clever. Ahh, I have the Honda “Big Shot” and the Starbucks water holder already! How creative to use one’s car to create art.